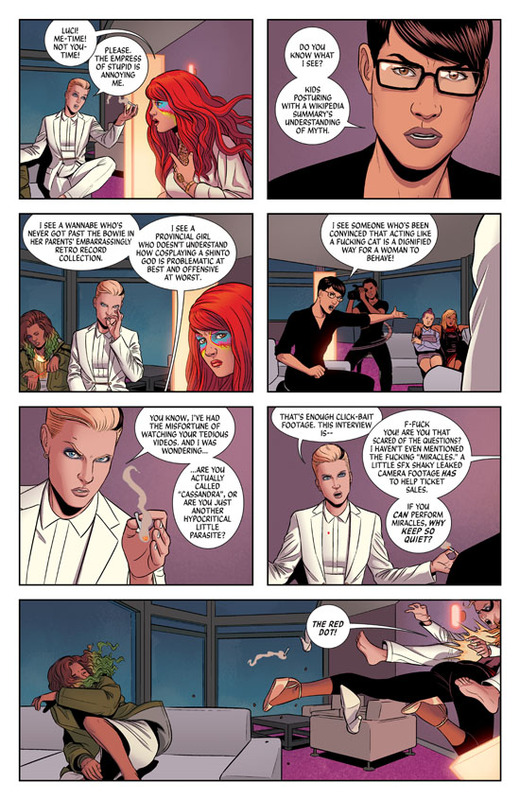 Nobody holds a concert in a comic book like Kieron Gillen and Jamie McKelvie. 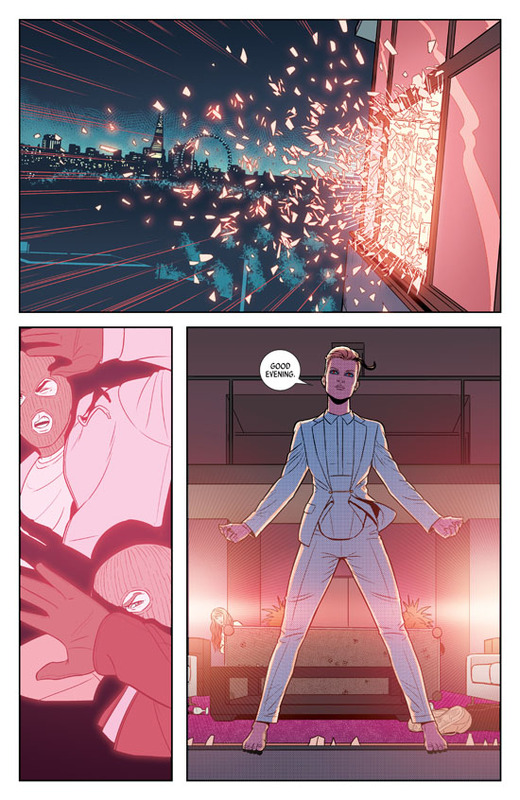 The one that opens the action of the first issue of The Wicked + The Divine is everything a good concert should be: bright, loud, more than a little psychedelic, and (most importantly) life changing. You feel it all, viscerally: the heat of the lights, the thrill of the crowd, the sound turned up too loud. And yet, from the get-go in TW+TD, we’re reminded that, as familiar as this all seems, it’s not the world as we know it. Instead of a wailing pop idol on the stage, it’s the incarnation of a Shinto sun goddess in the body of a 17-year-old girl, lit like a rock star. Incarnations like her are the massive celebrities right now. This “Amaterasu” is only one of a handful of gods currently incarnated as humans on Earth. They get two years like this before they die, and they spend it as you might imagine gods among men would: relishing every minute in the spotlight. Greek myths were some of the first stories to play with the idea of gods having human flaws, and it’s fun to see this idea played out in new ways in this book (an incarnation of Lucifer being raised on what my parents’ parents might once have called “the Devil’s music”, for example). 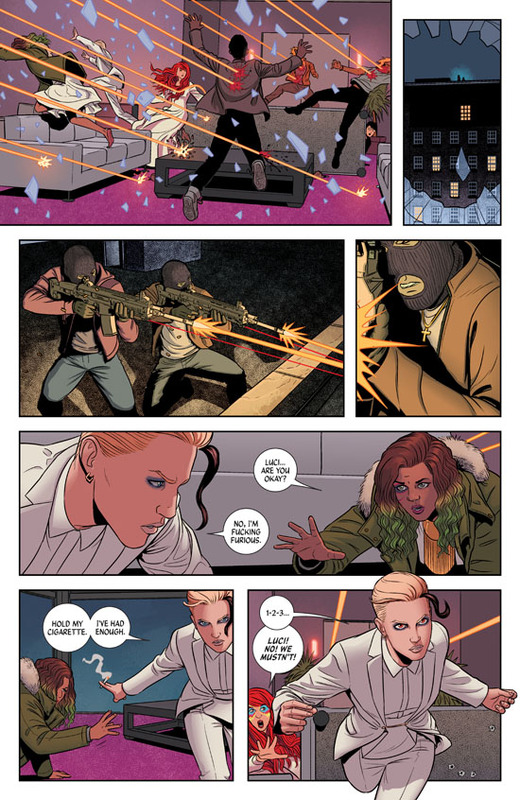 Gillen’s quick-paced writing dares you to keep up with it, as the issue wastes no time between introducing these characters before throwing them into the fire. 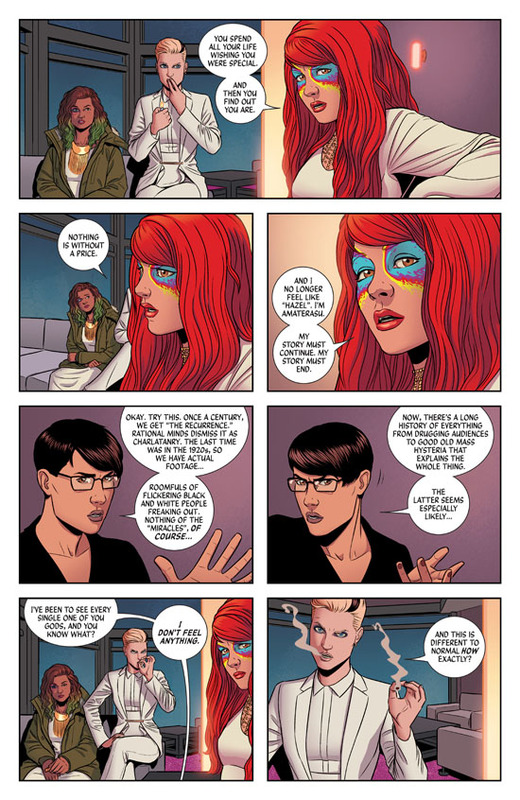 Sound has always been important to Gillen and McKelvie’s work. Their previous collaboration, Phonogram, followed the lives of phonomancers, wizards who use specific genres of music to channel their magic. 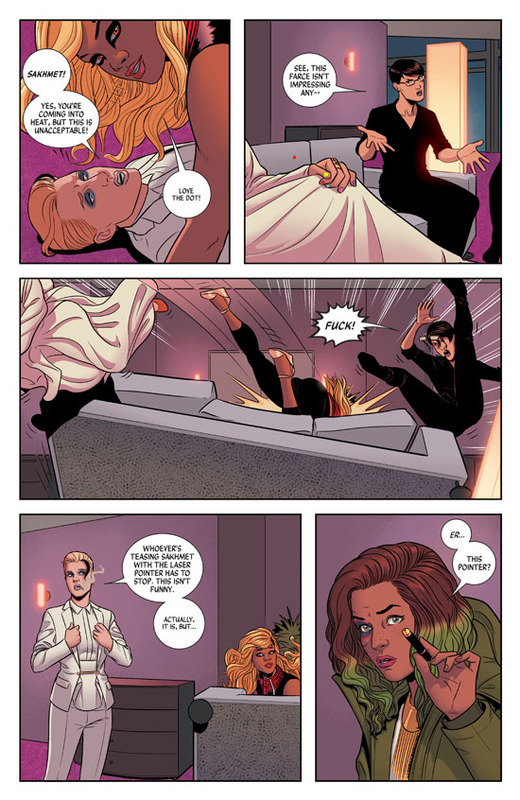 Both projects eschew traditional “WHAM-POW” sound effects, instead allowing the presence of sound to been felt and seen in its effect on the characters and the environment. The real magic, though, is the look of this book. 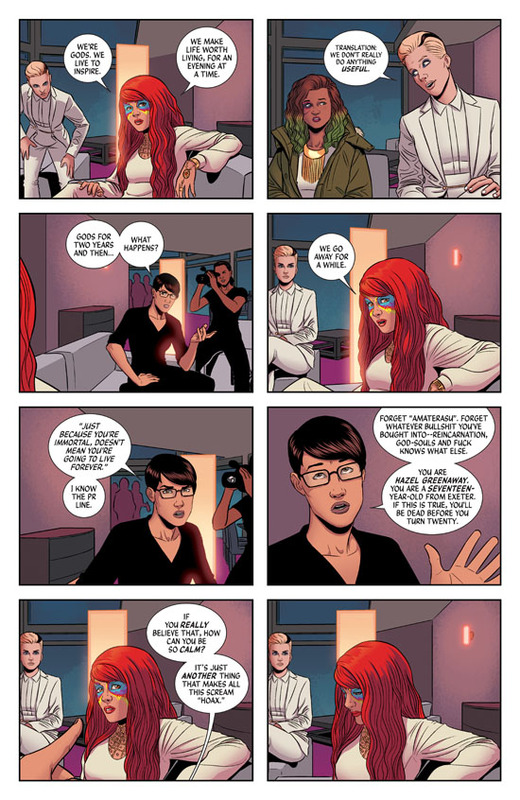 McKelvie’s realistic style is as sharp and clear as it ever was, and his character designs are hip and cool in such classically British ways. And it is colored beautifully, I cannot stress this point enough. Colorist Matthew Wilson’s hand on this comic makes it look like Charles Rennie Mackintosh had a baby with Lady Gaga. The fluorescent colors fight to be confined to the careful lines around them, and the result is gorgeous art that has a spark of life on the page. 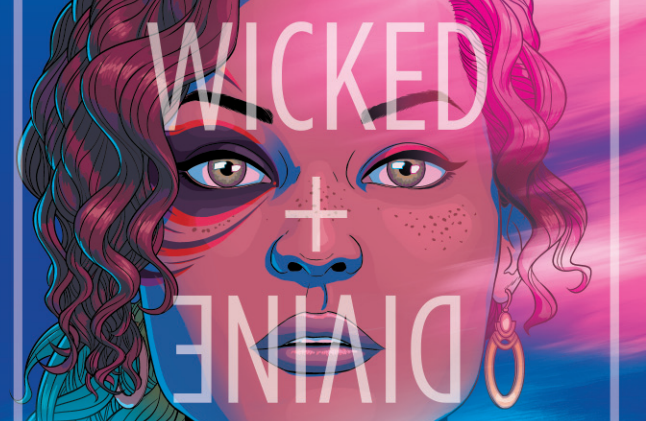 The Wicked + The Divine #1 is on sale tomorrow in print, through Comixology and as a DRM-free pdf from Image’s digital comics storefront. You can check out a six-page preview below!